Kings Theater, in Flatbush Brooklyn, is more like a palace than a theater. This 1920s building dates back to a time when seeing a movie was an event—and both the people and the architecture was gussied up accordingly. Kings deteriorated quickly when in closed in the 1970s—but now, a small army of specialists is hell bent on restoring its former glory. The main amphitheater was what they called a "scaffold jungle." All the seats had just been ripped out to make room for thousands of feet of scaffolding in order the repair the ceiling. The women's powder room was a stark contrast to the mens, though neither had begun restoration yet. Inside the ladies' room, the walls were crumbling, and holes in the ceiling and walls revealed iron reinforcing and piping between rooms. Along the trim of ceiling in the men's room, a huge mural telling the story of a knight who kills a dragon, rescues a maiden, gets kissed (or slapped in the face), and then kills some other knight who probably was trying to impress the dragon-slayer's girlfriend. Some patches along the walls were completely missing, so during the restoration they'll need to get an artist to repaint the story along the walls in the exact style. To my inexperienced eyes, it looked like the restoration process is far from over. Entire plaster molds of columns lay in the main auditorium for use on areas that needed to be completely cut away. On the other hand, if you focus on the parts that are fully restored? The transition was seamless. 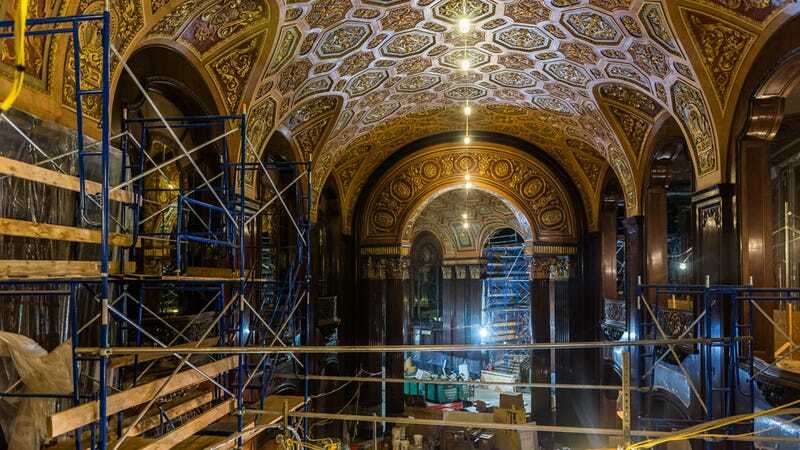 When I walked in and looked at the lobby canopy, I couldn't imagine that it ever looked any different than the ornate, golden-trimmed majesty it is today.